Zygopetalum orchids are not only beautiful, they are also quite fragrant and therefore highly prized. Another good thing about Zygopetallum orchids is that their waxy flowers are long-lived, that’s why you can find Zygopetalum hybrids at shops, so popular they are. And some species flower in fall and winter, when nature is dormant, colors are dull and flowers are in such great demand to brighten life. Most popular species and hybrids have blue lips or entire flowers, and the blue color is rather a rare color in orchids. In addition, they are relatively easy in cultivation. So, these orchids from tropical rainforests are rather a good choice for cultivation. Zygopetalum (and related orchid genus Zygosepalum) are sympodial orchids from equatorial South America. They have ovoid, closely spaced pseudobulbs (which makes the main problem in their cultivation – the space between pseudobulbs is poorly aerated so highly prone to fungal infections and rotting due to stagnant water), creeping rhizomes and large, dark green perennial leaves. The inflorescences are few flowered – up to 7 large waxy flowers and rather long. The plants tend to be medium to large sized. 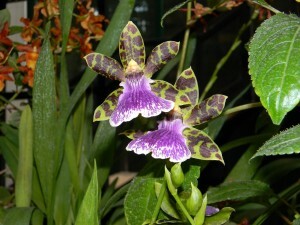 There are fourteen currently recognized species within genus Zygopetalum and five in genus Zygosepalum. Type species Zygopetalum mackaii has 4 inch wide fragrant flowers with dark blue to purple lips and brown sepals and petals. Zygopetalum brachypetalum has 3 inch wide also fragrant flowers with narrower sepals and petals of green color with profound brown markings and white with blue strips lips. Zygopetalum crinitum has 4 inch wide flowers, beautiful white with red to purple lips, tepals are brown with some green. Zygopetalum intermedium is lovely cool-temperature terrestrial with up to 3 icnhes wide flowers with red to brown through orange sepals and petals and red to purple with white lips. Zygopetalum maculatum is a small sized orchid with 2 inch wide flowers. Zygopetalum maxillare has more round-shaped 2 to 3 inch wide flowers with green-brown sepals and petals and lilac lips. Zygopetalum microphytum is another miniature with pure white lips and green sepals and petals. Zygopetalum pabstii is a large flowered (4 inch wide flowers without aroma) species with purple lips and green with brown spots tepals. Zygopetalum pedicellatum is giant sized with relatively small (2 inches wide) as for large orchid flowers, lips are white with some purple, tepals are greenish brown. Zygopetalum reginae is unique – it has white lips and greenish yellow sepals and tepals and seems to be some a king of natural albino. Zygopetalum sellowii is miniature with inch wide flowers, lips are red-purple. Zygopetalum silvanum has extremely lovely 3 inch wide flowers with green sepals and petals and light blue to purple lips. Zygopetalum sincoranum is small sized and have whitish blue lips and green with purple dots sepals and petals. Zygopetalum triste has extremely bright and beautiful 3 inch wide flowers with dark purple lips and dark red sepals and petals. There are some extremely beautiful hybrids such as Zygopetalum Advance Australia, Zygopetalum Rhein Blue Angel, Zygopetalum Rhein Clown, Zygopetalum Jumpin Jack and many other which are as much as beautiful as species but rather easier in cultivation, so it is better to start growing Zygopetalum with its interspecies and intergeneric hybrids rather than with species. 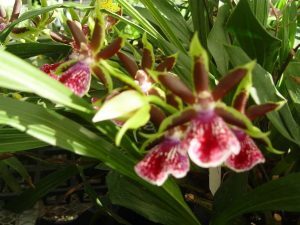 Zygopetalum orchids grow in tropical rainforests and mountain cloud forests in shady places either epiphytically or as terrestrials. Zygopetalum orchid care is not very difficult. They require not very high light levels – similar as for Phalaenopsis or Cambrias would be OK, direct sunlight is not preferable. 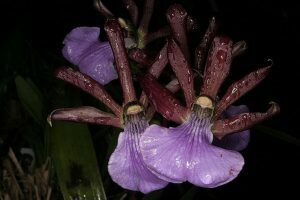 Temperatures are mostly warm to hot, but there is some mountain terrestrial species which require cool to intermediate temperatures such as Zygopetalum maculatum and Zygopetalum intermedium. Watering should be ample when the plant is actively growing, but when pseudobulbs are mature it is a good idea to reduce watering to promote flowering and reduce the risk of rotting. Zygopetalum orchids are heavy feeders so you should fertilize it weekly when in an active growth stage, at the start it is good to apply more Nitrogen-based fertilizers, and as pseudobulbs mature it is good to switch to more balanced formulations with more Phosphorus and Potassium. Potting mixture should be both well-aerated, allowing air to circulate freely and with moderate water capacity. It should contain medium bark, charcoal, sphagnum moss, some cocoa chips and perlite, there are some good reports about a semi-hydroponic culture of Zygopetalum orchids. Air movement should be really strong because through closely spaced pseudobulbs it is high risks of fungal infections through the stagnant wet air, that’s why it is a bad idea to mist Zygopetalum orchids, mist makes a brown spot on leaves and increase risk of rotting, any water drops on leaves and pseudobulbs should be dried. Another growing tip is to pot the plant higher than usual – rhizome is rather prone to rotting through contact with a wet substrate.